body. This elastomeric seal prevents fluids and gases from leaking. The Soft-Seal fitting assembly consists of four parts: threaded fitting body with o-ring groove, o-ring, nut, and sleeve or tailpiece. Other o-rings have been tested and are available for special applications. The fitting assembly seals when the bottom of the sleeve or tailpiece, which has been fixed to the tubing, compresses the oring in the face of the threaded fitting body as the fitting nut is threaded onto the external threads on the fitting body. The threading process draws the sleeve into full contact with the face of the fitting. Sleeves or tailpieces can be secured to the tubing either by brazing, welding, or mechanically flanging the tubing. Type SS 316 stainless steel is the standard material on all bodies and nuts. Type SS 316L (low carbon) is used for sleeves/tailpieces. Buna-N is the standard o-ring material for SAE and NavSea. gases. After securing the sleeve onto the tube or pipe, it is then extremely easy to install. The fitting is also a "zero clearance" system, meaning you don't need to spring or pull the tubing to seat the fitting, or purge the system. 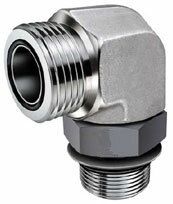 This tube fitting can be disassembled and reassembled many times. Simply replace the o-ring and tighten to recommended torque. The elastomer softseal conforms well to irregularities in the fitting face or sleeve. variation. Soft-Seal tube & pipe fittings are highly recommended on high vibration systems because the soft-seal absorbs shock better than metal-to-metal sealing systems. Committee 131 for all new hydraulic system design. The NavSea Soft-Seal design is widely used in Naval and commercial ship building and repair. Other applications include test laboratories. Size Available (nominal) 1/8" - 2"